I did some meat loaf on two trays and crispy potatoes on a third. I left the fourth tray off. Just wanted to share some photos. I haven’t seen any one do meat loaf as yet. It came out ribolicious, of course. I used The Rib-O-Lator to roast butternut squash pieces stuffed with a shumai paste (shrimp, pork, vegetables plus seasonings). It’s the stuffing you find in Chinese restaurants in dumplings. They all slid to the side of the trays and would have overturned in the rotation of the rotisserie. I used toothpicks in each piece to act as a counter balance and the squash pieces never moved. Amazing just like a tight rope walker using a pole for balance. I served my wife and myself these Rib-o-licious treats with a just picked garden salad with an apricot vinaigrette that I also used as a sauce on top of the squash. Light and healthy and delicious. I used two trays to make four calzones (each the equivalent of two pieces of pizza from a 14″ pie cut into 8 slices) from my pizza dough today. they turned out ribolicious. I baked cinnamon raisin sweet rolls with apricot topping this morning. What can I say? A grill is just an oven at times. They baked perfectly & evenly as opposed to the kitchen oven where there are hot and hotter spots. I realize that wings are not unusual to prepare using The Rib-O-Lator but these tasted like Peking duck as they marinated for 2 days. It’s nice to not have to add sauce to get great flavor. I fill one tray with potatoes to catch the drippings from the meat each time I use The Rib-O-Lator. The potatoes always come out crispy and delicious. I experimented today with a breast of veal (the entire rack of veal ribs) stuffed with a potato mixture. Since I only used one of the trays, I used some tiles as a counter balance for smooth rotation. As you can see, the veal turned out perfect, and tasted fantastic. I experimented today with making hors d’oeuvre’s with The Rib-O-Lator. I just used a portion of each tray but could have cooked 4-5 times the amount I made. 20 minute cook using outside burners. Grill temp was 350°F at end of cook. From bottom to top: spicy potato knishes in puff pastry, sausage stuffed mushrooms with crunchy crumb top, the best pigs in a blanket ever, sweet mini peppers stuffed with fresh basil, dried tomato and mozzarella. Katie Schnautz took FIRST PLACE in two different BBQ competitions in the Kid’s Category for the best burger. She cooked them on The Rib-O-Lator of course. Way to go, Katie!! 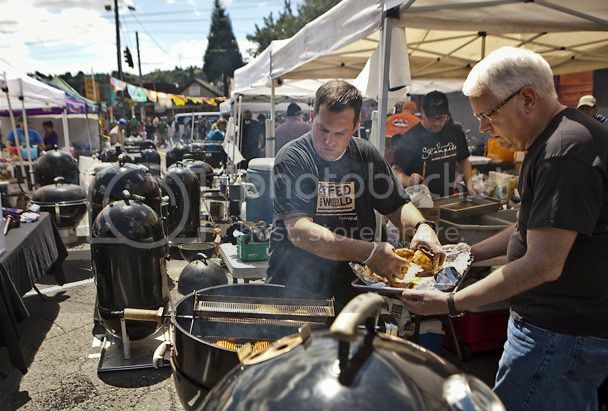 Chris Schnautz, of Bothell, loads chicken thighs from his father Steve Schnautz, of Redmond, into a device called a “Rib-O-Lator” during the Fremont BBQ Extravaganza on Sunday, a benefit to raise funds for the Solstice Parade, in the parking lot of Roxy’s Diner in Fremont. Chris’ BBQ competition team name is “Daddy and Me BBQ”, named for his daughter, but today, Steve was helping him out. “Today, it’s granddaddy and me,” Chris remarked. The Rib-O-Lator is a locally made rotisserie device that fits in a grill. To find out more about donating for the Solstice Parade, visit . . . These ribs where cooked on a Weber WSM at 225 for 4hr’s and as you can see they are cooking perfectly. I also use the Rib-O-Lator in BBQ competitions, this thing is fantastic. For my first attempt, I believe this came out great. My wife and her mother both loved it. The flavors of the marinade really made the difference. Will definitely make this again. More chicken that I’ve done. The Rib-O-Lator is my new favorite toy. The pictures say it all. Just wanted to let you know that we’ve used your product the past two years and it always turns out perfect. I have 4 children that have just reached the “always hungry” phase. So, recently I decided to use my fathers Rib-O-Lator as well. Check out the pictures I’ve attached. Here are some veggies and Brats. I cooked them a little longer as I like a the charcoal taste and as Rachel Ray would say they where “yum-o” I could eat that every night! I Rib-O-Lated some tri-tip steak. I cooked them at 200-225°F grill temp for 2hr’s and pulled them at 130 internal temp. I seasoned them heavily with Montreal steak seasoning. They were as tender as a Filet Mignon and had that salty prime rib flavor. The next morning I made a fried egg sandwich and topped it with thin slices of warm tri-tip. It was hard to tell which was more tender. I let my belly decide! I put 60 wings and drums on The Rib-O-Lator. I seasoned them with Montreal steak seasoning and cooked at 300-325°F grill temp for about an hour. When I got them to the table they disappeared faster than a trailer park in a hurricane. Here is dinner for the wife and I. She made a balsamic reduction for the asparagus, and the fish was like butter in your mouth. There where no left overs. Here are a couple of pork butts on The Rib-O-Lator. I seasoned them and cooked them at 250-275°F grill temp for 5 hrs and they turned out great. I made some Cuban sandwiches. (Pulled pork, sliced dill pickles, and mayo mixed with some Cayenne pepper). I ate them so fast I was chewing on my knuckles before I knew it.